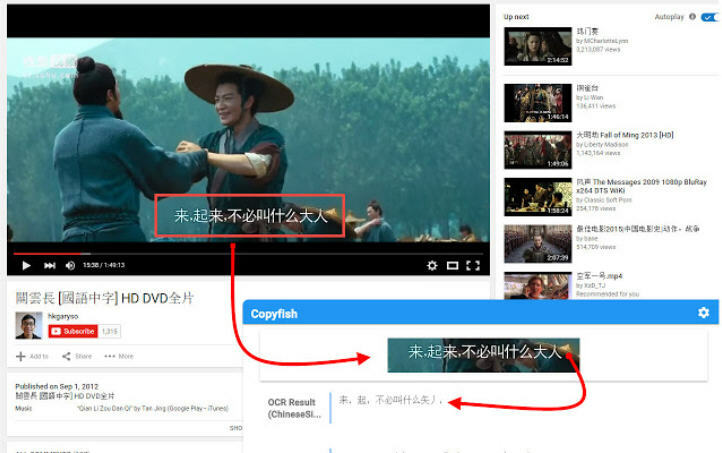 Copyfish is a free Chrome extension for extracting and translating text from images, videos, PDFs and more. The package couldn’t be any easier to use. Click the Copyfish icon on your address bar, click and drag to draw a rectangle around your text, and wait: the OCR result is displayed in a few seconds, along with a translated version. If the text looks correct, you’re able to copy it to the clipboard with a click. If there’s a problem -- or you need to extract multiple areas of text -- clicking "Recapture" allows you to draw another rectangle and get more results. A Settings dialog has options to set your preferred input and destination languages. Or, if you only need OCR, translations can be turned off entirely. The OCR -- based on the developer’s own web service -- didn’t always work well for us, in particular timing out a few times with large capture areas. Very small capture areas can have their own issues. We highlighted a single line of text to try and keep things simple, only for OCR to fail because our rectangle was below the minimum capture dimension of 40 pixels (the maximum is 2,600). Most of our test captures worked just fine, though, and the translation feature -- via Yandex -- also delivered good results. On balance, Copyfish’s easy OCR import and optional translation are nice touches which help it stand out from the crowd. Worth a look.